Rachel and Tyler planned an autumn wedding at the historic Rand-Bryan House just outside of Raleigh, North Carolina. The venue offered them countless options for both indoor and outdoor planning, but Rachel and Tyler decided to go for an open-air celebration. They had a creative vision of the day that they brought to life with some fun and thoughtful DIY details. The ceremony took place on the grounds surrounded by lush trees and green lawns. The wooden alter they created and draped with flowing white organza and strung flowers was the perfect backdrop for their vows and made for some gorgeous photos! The rich jewel-tone color scheme was the perfect celebration of autumn. 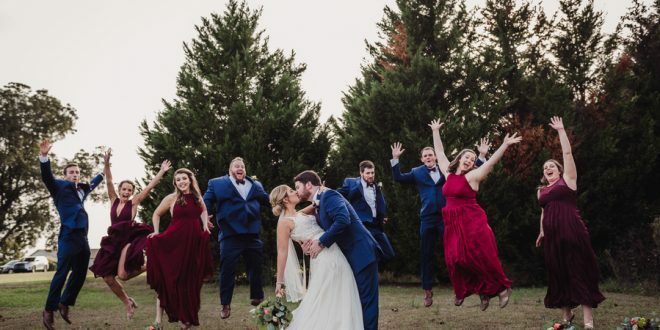 It was reflected in the bridal party’s styling as well as Rachel and Tyler’s florals, a blend of purples, deep reds and eucalyptus leaves which were designed by the bride and her bridesmaids from flowers they sourced from Trader Joe’s. Along with decorative accents like colorful goblets, brass candle sticks and gold trimmed votive holders, it all came together to create an upscale rustic vibe on the lawn of the 1871 farm house. We love all the personal touches that defined the day, like the cake which was made by the couple’s sister-in-law, Larissa from Cakes by Lala, with it’s wolf-themed topper – a shout-out to Rachel and Tyler’s alma mater, NC State. Another one of our favorite DIY details is the canvas that served as the couple’s “guestbook” on which Rachel painted the Rand-Bryan house and left space for people to sign. This creative couple’s effort and attention to detail paid off, so when it came time to party, they were able to sit back and enjoy a dinner of local BBQ before dancing the night away!